Although we all remember that everything started with legendary Norton Commander, somehow lots of TC users religiously believe that every other, two pane file manager, is a not worthy clone. They all share the same roots, but TC with its rich Plugin library managed to capture the largest user base. In this article I will try to cover the most popular alternatives for both TC and NC. It is not a review though, so you won’t find any particular recommendation at the end. Everyone chooses the set of features that is relevant for his or her needs. Unfortunately the Home site of this commander doesn’t provide a lot of additional info, but there are some more shots that might be helpful. 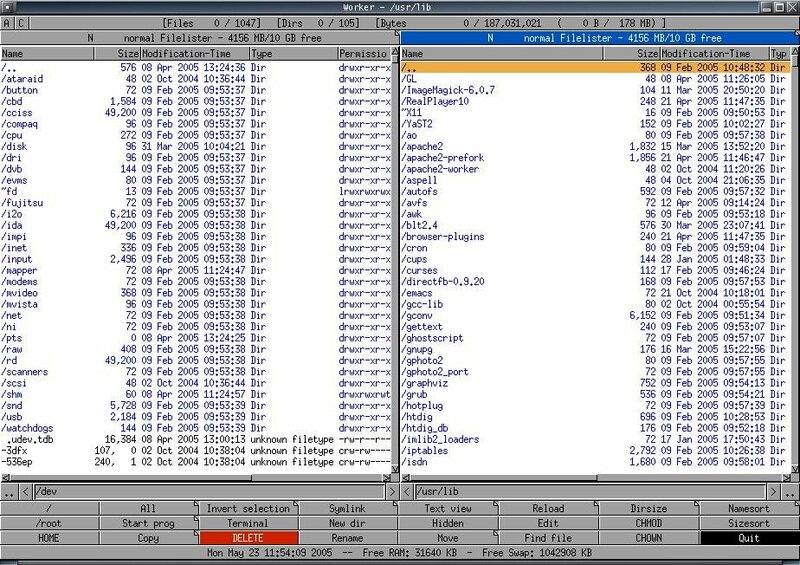 emelFM2 uses a simple and efficient interface pioneered by Norton Commander, in the 1980s. The main window is divided into three parts, described as “panes” or “panels”. 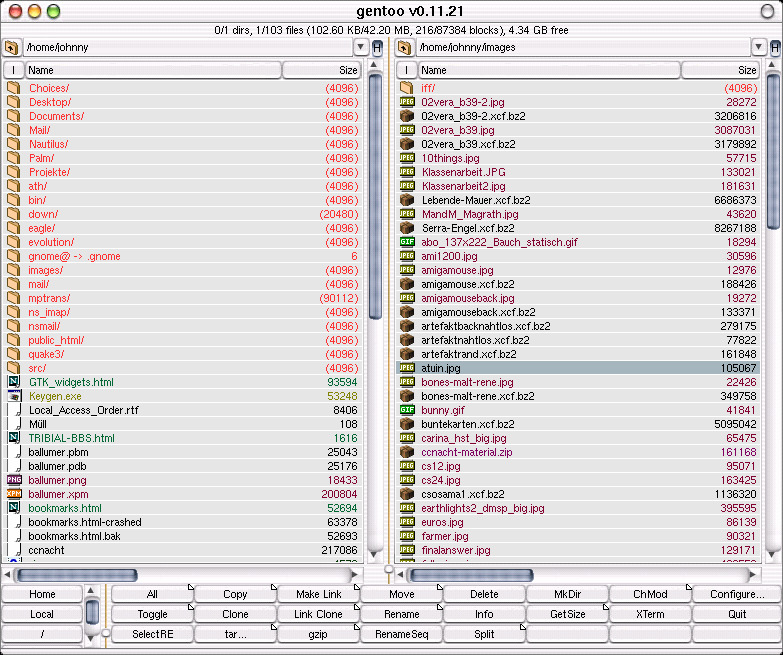 Two of those (side-by-side or top-to-bottom) show the contents of selected filesystem directories. 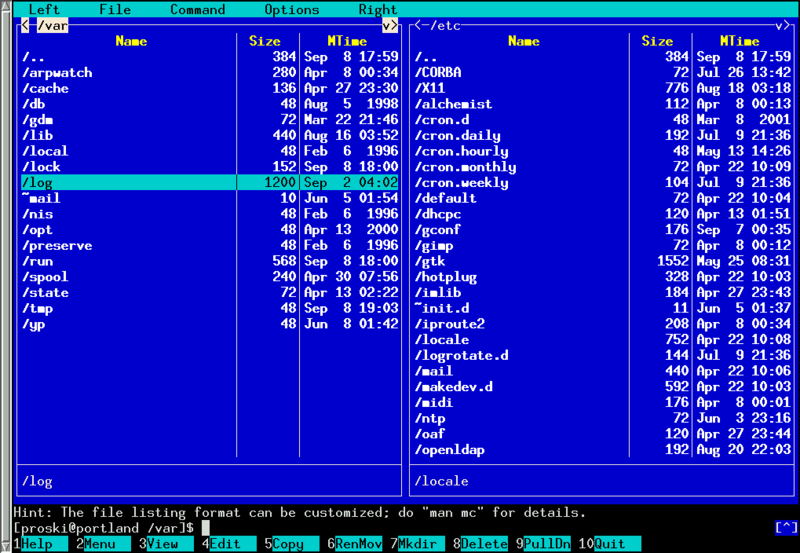 The third pane, at the bottom of the window, shows the output of commands executed within the program. Those panes can be resized, and any one or two of them can be hidden and unhidden, on request. A built-in command-line, toolbar buttons or assigned keys can be used to initiate commands. Includes more than 120 original pixmaps icons (16×15 pixels). GTK-2 GUI with standard mouse interactions. GNOME mime types (MIME-Type management under development). Right click mouse menu with the usual file operations to run, open, open with.., delete or rename files and folders, and also to set properties like ownership and permissions. Mouse context menu that easily can be extended by entries calling any kind of external application like viewers, editors or custom scripts to work on selected files or directories. Quick device access buttons with automatic mounting and unmounting (“no-mount” option for just quick access to folders or otherwise automounted devices). 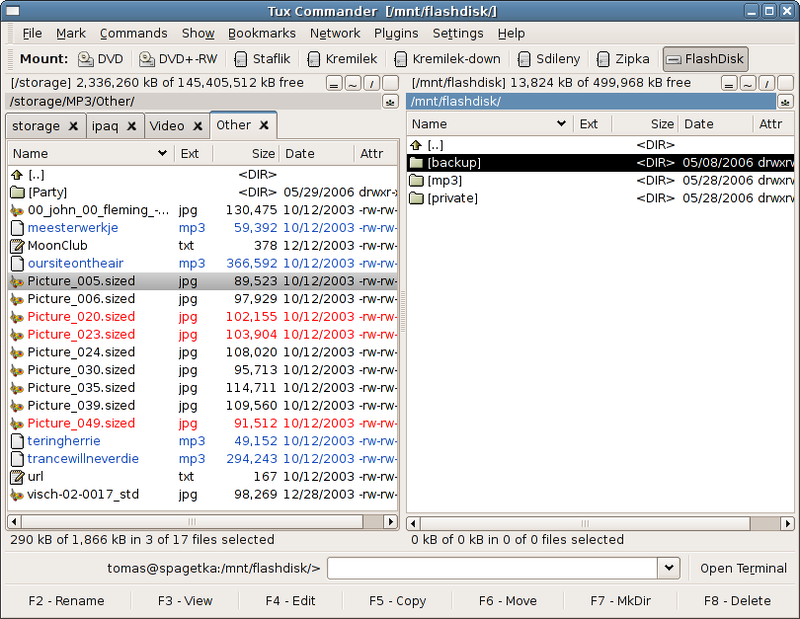 Fast file viewer for text, images and image meta data (Exif and IPTC). A tool for advanced renaming of files supporting various types of meta-data. IMHO the most feature rich file manager (CLI doesn’t count). I won’t list them all here, but you will find all the info you need on their home page. 8 years in development, with the new KDE 4 version which is knocking on the door, it might be the right choice for some of us. Being a text mode application, GNU Midnight Commander can be used locally or remotely, on the console or under X Window System. By using full screen space of the terminals, it provides an intuitive user interface to the operating system, aiming to be a useful tool for users with any level of experience, from a newbie to a guru. 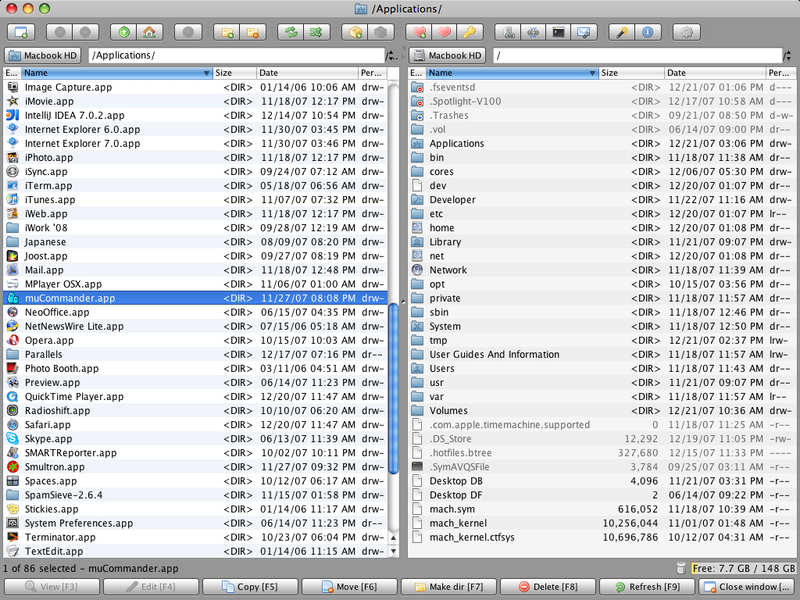 Java based file manager (that is why the MAC GUI) with all the advantages and disadvantages of that. Available in 20 languages : American & British English, French, German, Spanish, Czech, Simplified & Traditional Chinese, Polish, Hungarian, Russian, Slovenian, Romanian, Italian, Korean, Brazilian Portuguese, Dutch, Slovak, Japanese and Swedish. Additionally it’s possible to access servers using ssh, rsh, ftp, http and webdav. Xfe is small, very fast and only requires the FOX library to be fully functional. Plus, it can be launched from the command line in a fraction of second. Xfe can also efficiently complete terminal commands. I hope this article will help you decide which file manger is right for you. If you liked this article, please share it on del.icio.us, StumbleUpon or Digg. I’d appreciate it. This entry was posted on August 18, 2008 at 13:49	and is filed under File Managers, Linux, Software. Tagged: Alternative Software, Beesoft Commander, emelFM2, gentoo, Gnome Commander, Krusader, Linux, Midnight Commander, muCommander, Norton Commander, Total Commander, Tux Commander, Worker, XFE. You can follow any responses to this entry through the RSS 2.0 feed. You can leave a response, or trackback from your own site. Nice recap of what’s available. Thanks. I’m weaning myself from KDE. It’s good to see that XFE offers a tree view. I will be experimenting with it. I’ve been using TC in wine. And TC on Windows over samba. no Linux Commander on his site. LarsBjerregaard, you already said most of what I wanted to add. I also have used TC in Windows forever, and before that, I had in fact used Norton Commander in Dos 2.x for many years. What this article doesn’t mention is that TC is not only extremely feature rich, but also incredibly stable and reliable. Krusader is quite feature rich, but it is quite buggy too. I really miss TCs reliability in Linux. The one advantage of Krusader is that it’s Useractions can call bash scripts, when TC’s equivalent functionality is stuck with the lame cmd.exe batch scripts. 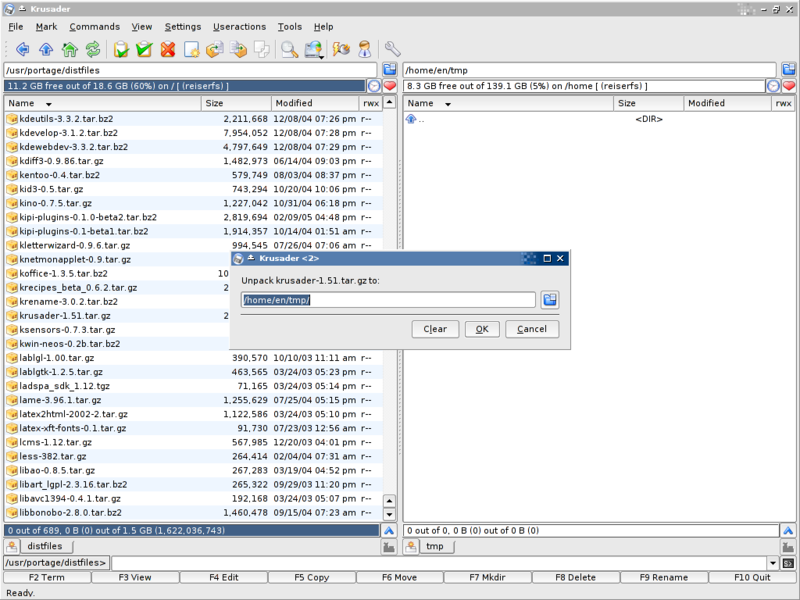 ofm (Open File Manager) – flexible small file manager with Norton Commander interface works equally well in console and your favorite term. Written in pure C of course. Actually, I have to correct myself. 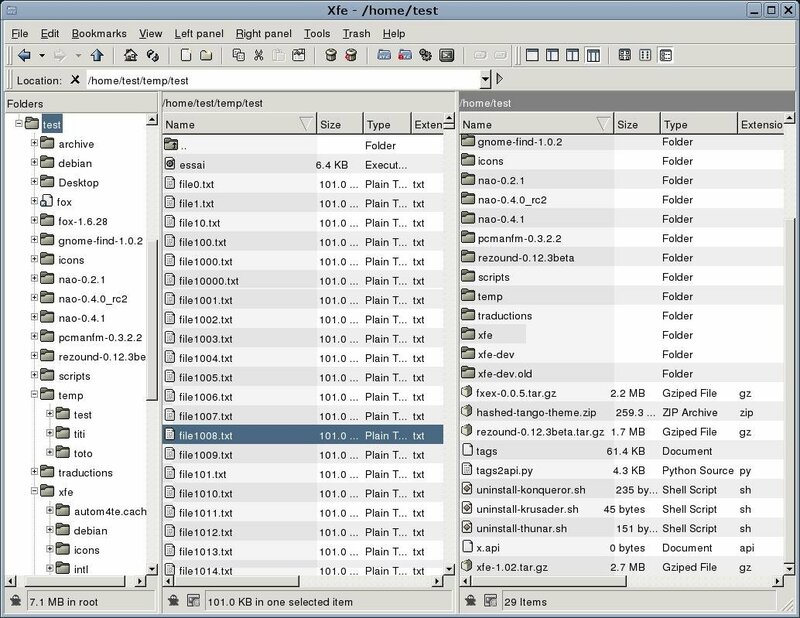 Worker file manager (also Commander clone) is probably better choice for people who like GUI then emelFM since it does depend only on X libraries. Krusader is really great ! But I still (and will) use my “old and faithful” Midnight Commander … Quite spartan in options, but for most usual needs is perfect. I like its “quasi-gui” which doesn’t need X; only a shell is OK for it (same like Norton Commander from grandfather’s glorious DOS days). Call me old fashioned, I acknowledge this ! how about running TC with the ext3 plugin under Wine? Nice article. But there is no real deal for total commander like yet. Mass file management is painful in Linux environment. Ladz and Gentz meet the Double Commander ! Thanks very much for pointing me in the right direction, after long searching for a close alternative to my preferred tool; < href="FreeCommander under Windows. This is a really excellent read personally, Must admit that you’re among the finest bloggers I ever saw. We truly stumbled on this on yahoo, and im happy Used to do. I’ll definitely be returning again. TC is fine, but linux is to difficult! Thanks for sharing this info and writing this article. I hope to read your blog post more frequently. Ive used many of these, but I always sticked to GnomeCommander and XFE. However, sometimes XFE takes a ridiculous amount of time to enter a directory. Now Im trying KDE so Ill go for Krusader. I always thought this program would serve my needs most, but i dont like running a kde app amidst gtk2+ apps. Thanks! Switching to Fedora now, so this comes to well use!. This is important. Many thanks for sharing this article. I’m obtaining an essential minimal trouble I cant seem to be effective at subscribe your own feed, I’m working with the various search engines reader. You need to find a better translation service. Took a tour of all listed alternatives. Sadly, nothing is a worthy match to TC. Yet Krusader is the richest, most configurable and most convenient of them all. By the way, Compiz seems to be lacking generalized support for Ctrl-Tab switching capability. Web browsers like Mozilla and Chrome implement this functionality internally, but none of the tabbed file commanders has it. Neither does gedit. It’s painful. Anyway, I’m grateful that we have Krusader. Pretty good post. I just came across your blog and also wanted to state that I possess really loved reading your blog posts. I am so glad I located this weblog. Thank you for the facts. You make a good deal of very good points in your post. Rated 5 stars! Considerably, the write-up is in reality the sweetest on that notable subject. When planning your habit wedding dress, you possess a number of options. Nice review! This is exactly the type of information that needs to be shared around the internet. Sad on the Google for not positioning this blog post higher! Just post, We liked its content and style. I found this web site on Yahoo and have now additional it to my personal bookmarks. I will be sure to visit once again soon. Heya i’m for the primary time here. I found this board and I in finding It truly helpful & it helped me out a lot. I’m hoping to offer one thing back and help others like you helped me. Viagra is a medication in operation for treating manful propagative disability. Viagra is a blue gravestone manufactured in 25, 50, and 100 mg tablets on account of treating erectile dysfunction. Having been nearly repayment for a oceans longer, Viagra has a massive safety path single and proven effects that start acting in 30 minutes and mould for thither 5 hours. Personally, I stay away from the stuff, myself. I get distracted easily. And when I using my file manager, Viagra can be very distracting. worked absolutely fine, I’d say its one of the better ones I’ve tried!! Excellent post. I was checking constantly this blog and I’m impressed! Extremely helpful info particularly the last part 🙂 I care for such information a lot. I was looking for this particular info for a long time. Thank you and best of luck. I agree with your 10 Total Commander Alternatives for Linux Lists, excellent post. Great goods from you, man. I have understand your stuff previous to and you’re just extremely fantastic. I really like what you have acquired here, really like what you are stating and the way in which you say it. You make it entertaining and you still care for to keep it wise. I cant wait to read far more from you. This is really a terrific website. Hi,I am submit your site to ask and Needed to post you this tiny word to be able to thank you again for these beautiful secrets you have featured here. This is really seriously open-handed of people like you to offer easily what most people could have sold for an electronic book to generate some profit for themselves, precisely seeing that you might have done it if you ever desired.Those good tips likewise worked to become good way to be aware that other individuals have a similar keenness similar to mine to know way more in regard to this condition. I think there are lots of more enjoyable moments ahead for individuals that looked at your blog. Hi, Neat post. There’s a problem together with your web site in internet explorer, might check this… IE nonetheless is the marketplace leader and a huge element of other people will omit your magnificent writing due to this problem. Do you mind if I quote a few of your articles as long as I provide credit and sources back to your weblog? My website is in the exact same niche as yours and my users would certainly benefit from a lot of the information you provide here. Please let me know if this okay with you. Thanks! Jeez this is a boring blog…can’t you find something more interesting to write about? GREAT REVIEW! I totally agree with pretty much all you said in your article, especially at the middle of your article. Thank you, this info is very valuable as always. Keep up the good work! You’ve got +1 more reader of your web blog:) Isabella S.
Roll on Windows 8, I love the concept of just pure application. It will be like having the Android on a normal PC. I am like a new kid with my iPad. And I just got the jail break working. This is a bit of a special case, but I own the Pandora (a Linux-based handheld) and lately I’ve come to love using BeeSoft Commander, which is very fast and has a better workflow than the other ones (full list of reasons here). Previously I’d used Xfe, which is also very capable but had a few things I didn’t like (always started in the Xfe directory, didn’t have a working search and required more use of the mouse – at least the nonworking search is only a problem on the Pandora version, possibly the other things are as well). Làm việc nhiều với Total Commander thấy nó tiện lợi đến mức nào. Qua Ubuntu nhưng vẫn cảm thấy không hiệu quả tý nào… Xem anh này chỉ ra 10 Total Commander thay thế cho Linux. Tuyệt! This is useful with my brother’s project, he ask me to help him. And I found this one useful for him. He will be gladly to see this one. Exactly, You’ve got a point in each and every sentence of yours. I’m sure this is going to help my brother as well and obviously I’m going to spread the word about this site, bookmarked and tweeted it right away. Cheers! I’m sure you were inspired by the words, “Many things have fallen only to rise higher..”. best online betting sites I must say, as a lot as I enjoyed reading what you had to say, I couldnt aid but lose interest soon after a although. Its as in case you had a fantastic grasp on the topic matter. What’s up to all, the contents existing at this site are genuinely remarkable for people knowledge, well, keep up the nice work fellows. a delightful post, can’t help but wait to examine a lot more of ur blog posts. Hi my mate! I would like to express that this text can be remarkable, nice published accessible using around very important infos. I’d like to glimpse much more discussions such as this . on Television, therefore I only use internet for that reason, and take the hottest information. might be able to fix this issue. If you havbe any suggestions, plase share. your articles? I mean, what you saay iis fundamental and everything. could undeniably be one off the greatest in its field. I would like to share that I found one more, and that suits me the best on xfce and gnome: sunflower. Pretty nice post. I simply stumbled upon your weblog and wanted to mention that I’ve really loved browsing your weblog posts. Thanx for sharing.It had been genuinely marvelous looking at with regards to all of your views on this particular area of interest.I had been looking for such a write up for a long time,and fortunately i came accross your blog.I’m hoping you will continue to keep assisting people in a similar manner in future also. Can anybody buy it from a bookstore? It had been important to set this out in full in every will until STEP condensed this material into its Commonplace Provisions. The Senior District Choose of the Household Division issued a Apply Path on 30 January 2013 enabling the incorporation of the STEP Customary Provisions (Second Version) into wills by reference. Labour chief Andrew Little has been a robust supporter, nonetheless the Authorities has dragged its toes till now. There are actually numerous particulars like that to take into consideration. That is a nice level to carry up. I offer the thoughts above as general inspiration however clearly there are questions like the one you bring up the place a very powerful factor can be working in trustworthy good faith. I don?t know if best practices have emerged round issues like that, however I am positive that your job is clearly recognized as a fair game. Each boys and girls feel the influence of only a second’s pleasure, for the remainder of their lives. Multi-panel tabbed file and desktop manager with tree views for Linux with built-in VFS, udev- or HAL-based device manager, customisable menu system, and bash integration. I found this Spotify playlist that I think every person here would really like. http://spoti.fi/2v7a0MA Give It A Look! This web site is really a walk-by for the entire data you wanted about this and didn’t know who to ask. Glimpse right here, and you’ll positively discover it. 1) Pretty! This was a really wonderful post. Thank you for your provided information. I seldom comment, but i did some searching and wound up here . And I do have a couple of questions for you if it’s allright. Could it be only me or does it look like some of these responses appear like left by brain dead visitors? 😛 And, if you are posting at other online social sites, I would like to keep up with everything fresh you have to post. Could you make a list of the complete urls of your community sites like your twitter feed, Facebook page or linkedin profile? Just came across this website showing various ways to make some extra cash, deepwebsites.org. Anyone tried any of these? These look interesting.